Travel can be exhausting. Not only do you have to contend with long lines, security checks, lugging that luggage around, jet lag, and rubbing elbows with strangers for hours on end, but there is also the ever-present issue of noise to deal with. We all know travel noise can be annoying or even downright disturbing -- the roaring cabin noise plus that crying baby a few rows back not only strains your ears, but it also frays your nerves, causing irritation and noise fatigue. Add ear pain from pressure changes, and flying can become a miserable experience. Don't panic: NoNoise Travel Ear Plugs are here! NoNoise Travel ear plugs are carefully designed to make flying much easier. They block noise, reducing that awful noise fatigue and helping you reach your destination feeling calmer and more refreshed (especially if you're trying to sleep on the plane). They also provide protection from rapid pressure changes, regulating the pressure inside your ear canals and cutting down on ear discomfort, particularly during takeoff and landing. Best of all, NoNoise Travel Ear Plugs do all of this without disturbing your ability to communicate. You can still hear safe sounds such as voices clearly while wearing these ear plugs! High precision patented ceramic filters cut the noise, but won't cut out conversation, making these ear plugs a truly excellent choice for travel and flying. Tip: These flying ear plugs are also great for the subway, bus, train etc. Unique, patented ceramic sound filters for high precision, new-generation sound blocking. Silicone-free with soft, hypoallergenic thermoplastic construction for superb comfort. 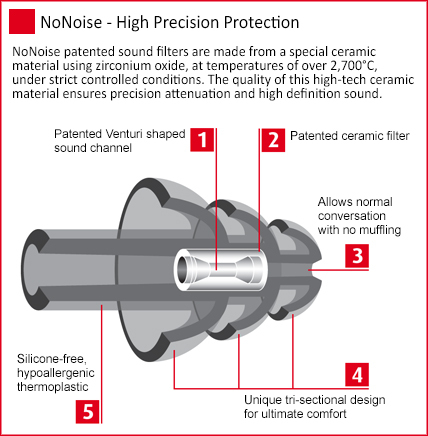 Patented Venturi shaped sound channel cuts down background noise. Allows normal conversation without that muffled feeling. Triple flange design for a comfortable, effective fit. Regulates pressure for reduced ear pain during flight. Includes FREE handy and stylish carry case. NoNoise Travel Model 161 Thermoplastic Reusable Ear Plugs (SNR 20) (One Pair With Case)5Susan RamseyMay 14, 2018I used them on a recent flight and they worked really well. Would definitely order again.